Young Children and their parents are preparing to gear up for their first day of school next year. It is time to purchase school uniforms, shoes, backpack etc. With all the preparations for gearing up for this the start of ‘big school’, we want you to make sure you don’t forget to check your children’s health! One of the main reasons school children are prone to getting back strains is because they are carrying heavy school bags. An over-stuffed, incorrectly packed or worn backpack can put unnecessary stress on children’s spines and can lead to back pain and possible damage to your child’s spine. The current recommended guidelines state that you should only carry up to a maximum of 10 percent of your body weight in your backpack. A bag with two shoulder straps is always best. Keep in mind you must use both shoulder straps to allow for evenly distributed weight between the shoulders, and using the waist strap to help distribute the weight onto the hips with heavier items closest to the back. Managing the size and weight of the bag is vital for ensuring your child’s spine is correctly aligned and not over worked. 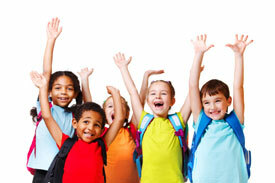 At JR Chiropractic, we invite you to bring in your child’s school bag so we can help you fit it correctly. Another important thing to take into consideration with your child is having the correct footwear. Children spend around 30 hours a week in their school shoes, so it’s very important they’re fitted correctly. In the first 11 years of a child’s life, feet will grow through over 12 shoe sizes, up until they’re 18 years of age, and ill-fitting shoes can lead to problems in adulthood, such as ingrown toenails, corns and bunions, which may even require surgery later in life. Our Chiropractors can assess your child’s spine and nervous system, and work with you and your child to plan the best way forward. The Chiropractor will take a complete medical history, conduct an examination, and ask you and your child questions. Your chiropractor will discuss with you which type of Chiropractic treatment is the most suitable, and if referrals to other health practitioners are required. Chiropractic care is safe, gentle and effective without the use of drugs or surgery. It can assist the young body to adapt to growth-related changes and will be able to assess your child and provide correct exercises to address any muscle imbalance that may be making it difficult to keep a good posture. Effective, early diagnosis and treatment can prevent other problems from occurring. Call today or book online to organize an appointment and start feeling the benefits. From November through to the end of January we will be offering complimentary Scoliosis and Posture checks to provide you with information and tools to help you make the best health choices for your families.